To get a good semblance for what this photo journal is about, I suggest exploring the Favorite Entries at the left side of this page. I would like to commemorate two special occasions this fine November 30th: First, my father's birthday. My father was the man who inadvertently got me into the hobby of postmark collecting. He's been collecting postmarks and visiting post offices since 1960. I must confess, my first impression of the hobby, as a kid, was one of pain endured while waiting in the car for him to stop in post offices and get cancels during our family vacations. I wanted to start playing Mini-Golf already! He also spurred me on to my first attempt at obtaining a postmark at the age of 15 in Northampton, MA, while I was up in the area attending a summer math program. This was also my first unsuccessful attempt at obtaining a postmark. "We can't do that," the clerk at the counter told me. Lies. On November 28, 2011, at 3:02 p.m., my Camry traveled its [her?] 100,000th mile. The setting was the majestic [cough] West Shore Expressway of Staten Island, just south of Victory Boulevard: Exit 7, and approaching the site of the Great Kills garbage dump (now park). There isn't even a post office there! Perhaps 150,000 will be more photogenic. My Camry has helped me explore 42 U.S. states and four Canadian provinces. I fully intend on driving it to Alaska some summer. 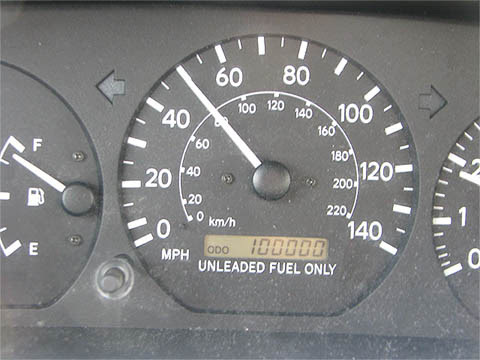 The car has only known life within my family; my mother drove it from 1999 to 2008. Beginning with my cross-country road trip in August 2008, I've put 56,000 miles on the car, and it [she?] is now mine. I maintain my car thoroughly, taking care of it just as well as it takes care of me. Your dashboard looks just like mine, except without the thick layer of dust! Being a Camry, the car is still young, and its looking forward to the AlCan Highway! I think I'll opt for a summer Arctic mosey, as opposed to attempting my own version of Ice Road Truckers. In July, when the sun only goes down for a few hours, you can take a LOT of pictures. I'm guessing we've arrived at the same conclusion that we should visit northern latitude offices during the summer, and lower-latitude offices during the winter, to maximize our total daylight photo time. Err... I mean because the climate is more mild in each circumstance. Right.